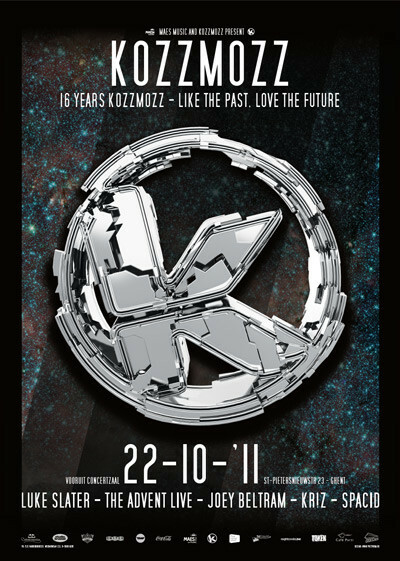 Get your spacesuits ready and prepare for another gripping journey in our very own Kozzmozz time machine. We will transport you through hyperspace to visit the future as well as the past. The Kozzmozz spaceship embarked on its maiden voyage into the universe of techno in 1995. During the past 16 years it has explored and conquered all different shades and evolutions within the genre showcasing a wide range of big international guests and Belgian wonders in several great venues. This time we have invited some guests who have joined us in the past and who have been at the forefront of the techno community since the very beginning. All have some real techno classics and anthems to their name. They all didn’t rely on those for the future either as they are still very active and innovative today. They completely represent this editions slogan: like the past, love the future and will all be playing both old as well as new tracks. Luke Slater’s legendary ‘Planetary Assault System’ project has been active for some 15 years now and the equally legendary, be it more recent, Ostgut Ton label now introduces the next instalment in Luke Slater’s ’Planetary Assault Systems’ ongoing voyage of discovery with ’The Messenger’ album which will be released the Monday after this Kozzmozz party. Over 12 tracks of exploratory techno and electronic in which Slater chases that fundamental wave - seeking out new sounds while staying very true to the original PAS ideology. Slater provides again a real electronic album that is as listenable as it is challenging, memorable and progressive. Vast expanses of noise, texture, infectious rhythm and challenging melodic structures are carefully explored and charted, indeed much like a pioneering voyage into the unknown corners of the universe. On this edition of Kozzmozz he will bring a Luke Slater dj. set with as many classics as new material, special Luke Slater style. Cisco Ferreira aka The Advent is one of Kozzmozz’ favourites and has joined us many times. He started his career as producer for Derrick May, Adonis & Fingers Inc before releasing his own techno tracks since 1988. He currently runs his Kombination Research label which is up to 36 releases of which the last one is another one of The Advent vs. Industrialyzer and getting raving reviews all around. The Advent teams up a lot with The Industrialyzer lately as we can also find recent tracks of them on Codeworks, Advanced Intelligence and Cari Lekebusch’ H-Productions. The Advent can also be found on lots of other labels as Tresor, Rotation, Electrix, Kanzleramt, DJ Gigolos, Pure Plastic and Synewave in his ongoing pursuit to keep making music and pushing techno to new boundaries. He will bring another mind-blowing live experience to the K-crowd, a performance especially developed around this editions theme of combining past and future. Third but not least we have Joey Beltram, responsible for ‘Energy Flash’, one of techno’s biggest classics. He’s been running his STX label since 1999 and brought us the album ‘Rising Sun’ on Tresor in ’94. Lately he has been doing lots of remixes for names as Oliver Huntemann, Umek and Adam Beyer. He’s also reviving the STX label with more own productions and remixes by the likes of Carl Cox and Alan Fitzpatrick. The three top notch international slammers will be joined by our residents Kr!z and Spacid. If you don’t know them by now, it’s definitely time to come and check them out on this anniversary edition ... those who joined us on last year’s anniversary know what we mean, a true techno fest like in the days. Expect another warp drive edition with special effects and light speed lasers for the ultimate B-day party pleasure!